This essay critiques the prevailing mentality that higher education should be an essential prerequisite for employment in many fields and, more broadly, that it is the most useful educational process available to us. It focuses on UK higher education as an example but draws upon evidence related to tens of other countries. The numbered references used are cited at a separate URL. 04) How do we Learn? Such expenditure necessitates an unequivocally well evidenced benefit of the same magnitude. Were no such evidentiary justification to exist, restricting career progression solely to graduates would be irrational and potentially unethical, on a similar scale. Comparisons to criminal sanctions can be used to contextualise the severity of the aforementioned exertions. For example, the UK Ministry of Justice describes how "offenders who get community sentences can be ordered to carry out between 40 and 300 hours unpaid work... this requires them to work hard and lose much of their free time" (04). The maximum community sentence imposable is therefore equivalent to the time commitment needed for just one fifth of an academic year. As can be seen from the below pie charts, sexual assault, ABH and burglary are all punished with a community sentence in about a third of cases (05). Over two thirds of all crimes in the UK are punished with fines and >99% of these are administered by magistrates' courts (06). The maximum fines these courts could inflict until 2015 was £5,000 (07). University attendance is therefore equivalent to approximately 9 times the maximum criminal fine traditionally imposable combined with >15 community service orders. What crime warrants such harsh retribution? There appears to be no evidence of the efficacy of university, particularly as a means of enhancing prospective employees' productivity. The onus is clearly on any organisation that mandates degrees as an essential prerequisite for career progression to justify this demand, particularly when they are obtained at the great expense of students themselves. Currently, higher education's pedagogies are simply not evidence-based. One group of researchers highlighted this issue with particular candour: "In this article a plea is made to use evidence in education. A remarkable difference in attitude is noted between university staff in their role as scientists in their discipline and in their role as teachers. Whereas evidence is the key to guide scientists in the development of their discipline, evidence on teaching and learning hardly affects their role as teachers" (08). Numerous other researchers identify the dearth of evidence that supports current practices and the "need for high-quality systematic reviews and appraisals of educational research" or decry the "science-aversive culture endemic among education policymakers and teacher education faculties" (09-14). The central point here is that advocates of university have the burden of proof to demonstrate its efficaciousness. Without this, imposing it on people by penalising those who do not attend, or who lack the "right" degree, is immoral, particularly when the demand originates from "professional bodies", rather than employers themselves. Given that UK HE employs over 660,000 people, this squandered human effort is not limited to students alone. Wastefulness is bad for employees, bad for employers and bad for society as a whole. Both rational and empirical reasons exist to seriously question the utility of university tuition. Peer-reviewed studies are almost invariably composed by employees of universities and unsurprisingly start with the axiomatic assumption that university education is beneficial and, at best, consider how tertiary "education" might be modified to improve it. The foundation itself is rarely questioned. Consequently, studies seeking to ascertain whether or not university itself is effective are near impossible to find. They are however not entirely unheard of. A nationally representative, longitudinal US study of >2300 students found that almost half made no gains across the final two years of their university-level education: "How many students show no statistically significant gains in learning over the final two years of college? Answer: 45 percent. A high proportion of students are progressing through higher education today without measurable gains in critical thinking, analytical reasoning, and writing skills" (15). Among students who did gain, the average gain would place a student who was at the 50th percentile point when starting at the 68th percentile point upon completion. This minuscule improvement could easily be attributable to the basal development of young minds rather than university intervention itself. In fact, given that the Australian Society for Evidence Based Teaching notes that "students progress 6 percentile points just by growing 1 year older", the "benefit" of university appears negligible (16). The findings of this 2007 research by sociologists Arum and Roska were subsequently corroborated by other researchers: "Our results with a different sample of institutions, a different sample of students, and a different standardized measure of critical thinking closely parallel those of Arum and Roksa. We conclude that the findings of Arum and Roksa are not the artifact of an anomalous sample or instrument and need to be taken seriously" (17). The OECD is a consortium of 34 nations that strive for mutually beneficial economic cooperation and development. The below image indicates that the the prevalence of higher education (HE) is increasing among the populations of most OECD nations. The green squares delineate the percentage of the total working-age population that have engaged in tertiary education, for each country, with the orange triangles revealing HE's prevalence among the younger generation. Across OECD nations, "38% of 25-34 year-olds have a tertiary attainment, compared with 23% of 55-64 year-olds" (18). Prevalence has doubled over the last few decades for many countries. The OECD's Programme for the International Assessment of Adult Competencies (PIAAC) "measures the key cognitive and workplace skills needed for individuals to participate in society and for economies to prosper" and includes problem solving, numeracy and literacy (19). There is no inter-generational disparity for literacy or numeracy in the UK, despite the prevalence of tertiary education among the younger generation being approximately double that of the over-34s (20, 21). Comparing PIAAC scores for nations with the highest prevalence of HE to the OECD average may grant further insight in to the efficacy of university education. Depicted below is the percentage of 25-64 year olds that have undergone HE in each OECD nation, with the top-8 coloured on the right, which includes the UK. Despite hosting populations with substantially more exposure to tertiary education, only two of the countries among the top-8 have average PIAAC scores above the OECD average, indicating that at best, HE adds nothing to these "key cognitive and workplace skills". As depicted below, Australia and Japan are the only two of the top-8 to surpass the OECD average PIAAC score (21). There is additionally no clear relationship between prevalence of HE and PIAAC scores. No PIAAC data is available for Israel. The OECD also performs PISA studies to assess the performance of 15 year olds and both Japan and Australia scored significantly better than average at this age too, indicating that their superior PIAAC scores are likely attributable to pre-tertiary education. Below, Japanese and Australian adolescents can be seen to have consistently outperformed the OECD average, while the US and UK, included as points of reference, generally performed slightly worse than it. Were HE of substantial benefit, those countries with the highest prevalence of HE would greatly improve their PIAAC scores relative to their PISA scores, compared to other nations. The pervasiveness of tertiary education within a population is far from the sole measure of its prominence and it might be claimed that international differences in funding account for the discordance between prevalence of HE and PIAAC competency. The biggest spenders are Canada, Korea, the US and Israel, which "spend between 1.8 and 2.9% of their GDP on tertiary institutions" (22). Though no data is available for Israel, not a single one of the other biggest spenders surpass the OECD average for literacy, numeracy or problem solving skills. Perhaps a more robust indicator of HE's financing in each country is the expenditure per year, per student. 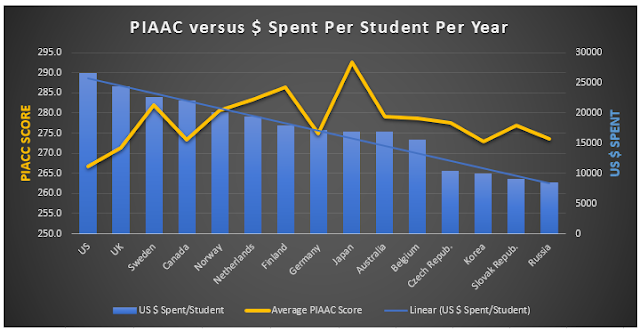 The below chart compares the US dollars spent per student in each country in 2012 with the average 2012 PIAAC scores for those countries. There is no clear correlation between spending on HE and performance, though a line of best fit (not shown) reveals a negative relationship. This is despite the fact that OECD countries spend far more on tertiary education per student per year than pre-tertiary education, averaging $7,719 at primary, $9,312 at secondary and $13,728 at the tertiary level in 2009 (23). All countries are included below where there is full PIAAC and expenditure data available (21, 24). • Those who currently occupy all senior positions within the industries graduated 20, 30, or even 40 years ago, or perhaps didn't graduate at all. ○ It seems implausible that they remember the contents of their degrees in any detail. ○ Their degrees would additionally have been vastly different from modern ones. • The contents of a HE course can also vary substantially from university to university, as can job-roles from employer to employer. • It frequently takes graduates a year or more to enter into some industries, by which time most of what they learned during their course, which is very unlikely to have been recalled during that interlude, will likely have been forgotten. • It is not the case that new graduates turn up to work and are expected to know how to do the job. On-the-job training always occurs. • Any information that is essential to doing the job will, by its very nature, be apparent and maintained within the working environment. As the aforementioned studies would suggest, rather than developing critical thinking, university is often little more than a memory test. This is not necessarily problematic as the defining feature of higher cognitive functions is that information is "held in mind for a period of time" (25). It is a problem however when this information is inefficiently assimilated, can easily be sourced if needed, and is neither enduring, nor relevant to future endeavours. Our memory serves to retain information. As an evolved trait, it must have been selected to be useful. A useful memory is one which retains useful information. Useful information, for the most part, is that which needs to be repeatedly recalled because recollection is instigated by need, which equates to utility. From this, we can deduce that our memories are intrinsically predisposed to best retain information that we have repeatedly recalled. There is a strong evidentiary basis to support the above deduction. "Taking a memory test not only assesses what one knows, but also enhances later retention, a phenomenon known as the [retrieval] effect" (26). Some researchers have even started to quantify this: "The advantage of retrieval practice... over elaborative studying with concept mapping... represented about a 50% improvement in long-term retention scores" (27). Multiple other studies further attest to the superiority of the "retrieval effect" for memorisation (28, 29). The hundreds of facts covered within a day's university lectures are often never recalled (retrieved) and certainly not repeatedly so. This is in direct contrast to learning on the job, where information is repeatedly recalled in order to produce the same product or service. Our evolutionary ancestors' lifestyles defined the selective pressures that shaped the genesis of our critical faculties and they learned on-the-job, rather than through attending universities. HE exhibits a profound indifference to our innate predispositions for learning. "PBL students discuss professionally relevant problems in small groups" (30). Research indicates that "by having students learn through the experience of solving problems, they can learn both content and thinking strategies" (31). PBL spontaneously occurs within the working environment in order to overcome obstacles to product/service delivery, or simply when optimising. There is no natural analogue within higher education's "conventional lecture-based learning environment" (32). Resolving occupational problems, such as equipment downtime, or those arising from human error, typically has an immediately apparent, real-world benefit, unlike even the most innovative of academic questions. It is difficult to conceive of any setting that could more effectively capitalise on PBL's ability to "enhance intrinsic interest in the subject matter" (33). Studies on PBL "generally support the superiority of the PBL approach over more traditional methods" (34, 30-38) but the scope of these studies is limited to the academic environment and the magnitude of the benefits is neither sizeable, nor consistent (30, 34, 39). One reviewer notes that "there is a wealth of theory underpinning the use of PBL... despite disappointing results; future research should concentrate on the reasons behind this uncoupling of theory and outcomes" (39). Resistance to questioning academia's role as the sole potential source of PBL may well underlie this anomaly. One study notes that "the use of authentic problems of practice... are presented as the catalyst for students' improved self-efficacy" (35). Another describes how "flexible scaffolding provided by cognitively and socially congruent tutors also seems to be reasonably effective, as opposed to ‘hard’ scaffolding represented by, for instance, worksheets or questions added to problems" (36). It therefore seems that the more PBL strategies emulate an occupational environment, the closer the unity between theory and outcomes. Overall, PBL within academia, like many pedagogies, appears to simply be a superfluous attempt to mimic the spontaneously arising experiences of those engaged in occupational work. It is a poor, unnecessary and counter-productive substitute, particularly when there are ample genuine professional conundrums awaiting resolution. Active learning is generally characterised by autonomously seeking out and using information, while passive learning simply involves being exposed to it, such as occurs in lectures. Multiple studies suggest that active learning may impart superior learning potential compared to passive approaches (40-43). Results are again mixed however, (44-47), with the academics often touted as the sole purveyors of teaching. Several studies identify the incongruousness of lengthy lectures with our natural attention span in such passive-learning environments. They note that "student engagement alternates between attention and nonattention in shorter and shorter cycles as lectures proceed" (48), with attentiveness rising "sharply to reach a maximum in 10-15 min" (49) and then falling "steadily thereafter" (50-51) and lapses occurring approximately every two minutes by a lecture's end (48). One study found that those who learned in order to put their knowledge to use, teaching others, "had higher conceptual learning scores" and felt "more actively engaged" than those who learned "the same material with the expectation of being tested on it" (45). A separate study used active learning to reduce "the amount of time spent in teacher-driven content delivery by 50 percent and covered the same amount of content with no detrimental effects on knowledge acquisition" (52). These findings highlight the benefits of learning for a useful purpose and the limited importance of lecturers to doing so. One researcher notes that visual-spatial thinking is "neglected in science classrooms", and goes on to criticise the "subservient role of visual-spatial learning with the dominance of the alphanumeric [memory] encoding skills in classroom and textbooks" (53). Visual-spatial thinking combined with vivid experiences, entailing extensive use of sensory perceptions, are the defining features of "memory palaces" used by "Memory Championship" contestants, in order to learn vast quantities of information. National champions Joshua Foer and Idriz Zogaj discuss and demonstrate the significant advantages of using vivid sensory experiences and visual-spatial memorisation for encoding memories in their TED and TEDx talks (54, 55). The world record for memorising the order of a shuffled pack of 54 playing cards using such techniques is under 21 seconds, as of 2015 (56). However, Foer now "rarely uses the techniques" as they are "hardly vital in an age of external memory in which remembering information may be less important than knowing how to find it" (57). The internet is the most potent means currently available for sourcing information and it is available to all, whether they have graduated or not. With the "university experience" being a popular colloquialism that emphasises the social, rather than educational appeal of university life, many who profess satisfaction with their HE may in fact be drawing upon fond memories of prolific socialising, rather than any intellectual transformation. Congenial memories of their first copulations or a subconscious desire to take ownership of their acquiescence to three years of drudgery may be alternative motives for graduates' positive reflections upon their HE experience. In the former case, various studies find that approximately 60% of students have "hooked up" within the first semester post-matriculation (58-61). A qualitative study of UK students found that "almost all participants spontaneously viewed alcohol as the cornerstone of students’ social life" and that students "were expected to have a very active social life" (62). Those who achieve employment in industries for which their degrees are an essential prerequisite will likely reflect positively on their HE, often without considering the extent to which their degree facilitated their current aptitude or whether this could be replicated by less burdensome means. A great many may, for example, erroneously conflate the desire to become a doctor with the desire to go to medical school, yet these two pursuits are not synonymous, even if the former is contingent upon the latter. The efficaciousness of universities appears to be a culturally enshrined myth, sustained to an extent by their selectivity, which excludes the worst candidates, who would likely make inferior employees on average, irrespective of educational background. Indeed, one study found that "educational credentials were the most common criteria employers used to solicit and screen resumes... [however], it was not the content of an elite education that employers valued but rather the perceived rigour of these institutions’ admissions processes" (63). There is additionally an intrinsic bias towards non-disclosure of educational inadequacies. A teacher who admits that their students are not well prepared calls their current employment in to question; a student who admits to being insufficiently benefited diminishes their own employability. Students are frequently forced through the HE system, either by the unsolicited intervention of "professional bodies" in their career progression, or by submission to the ubiquitous cultural narrative that HE is the only reliable means of escaping relative poverty. According to the 2015 nationally representative survey of >15,000 current UK students, 29% think their degree is poor or very poor value for money and "with the benefit of hindsight, one-third (34%) of undergraduates would ‘definitely’ or ‘maybe’ have chosen a different course" (01). This equates, in one year alone, to ~500,000 who may regret their costly investment. Current students' satisfaction with their courses remains high however, as do their perceptions of their preparedness for employment. This may well change once they are catapulted in to a saturated graduate jobs market with staggering debts as their pre-eminent memento of HE. 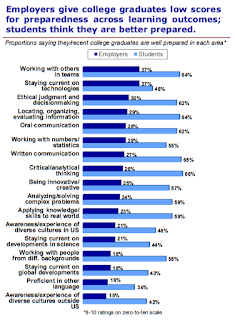 Research published by the Association of American Colleges & Universities reveals the "notable gap" between employers' and graduates' perceptions, as depicted above. The survey concludes that "large majorities of employers do not feel that recent college graduates are well prepared" (64). Medical practitioners must be fully competent to deal with critical, "life or death" situations, perhaps more so than members of any other profession. This is reflected in the working hours required of medical students, which trump all other subject areas, at just under 44 hours per week in the UK (01). Furthermore, these courses last 5-6 years, almost double that of a typical degree, and must therefore represent HE at its most rigorous. A nationally representative survey of newly qualified doctors found that only 4.3% strongly agreed that their tuition had prepared them well for their jobs. Over 40% disagreed or strongly disagreed that their HE had left them well prepared (65). Another study seeking to establish whether or not consultants and specialist registrars considered newly qualified "F1" doctors to be well prepared by their HE did not provide reassuring results: "F1s were seen as not prepared for starting work... overall, F1s in the study were not well prepared either to perform the tasks that await them or in terms of most of the specific background knowledge and skills necessary for the successful execution of those tasks" (66). Research on recent medical school graduates found that they "rated themselves significantly higher than did their consultant supervisors in thirteen out of the seventeen areas tested" (67). This finding replicates the previously depicted employer/employee disparity and sheds further doubt upon the reliability of the value students attribute to their own HE. A study of new graduates trialled an "extended induction" in to the working environment as well as assessing doctors' abilities pre-induction and then again, after one month of on-the-job experience. It found that "newly qualified doctors do not feel prepared... and objectively are not competent in basic clinical skills." However, "one month into post there were significant improvements in all areas" (68). A nationally representative US study of clerkship directors, who are responsible for the final years of trainee doctors' tuition, mirrored this, with almost half "concerned that students do not receive adequate preparation in key competencies before starting the core clinical clerkships" (69). It is noteworthy that the pre-clerkship portion of training is the largely classroom-based component of medical school. Yet another study, of newly qualified doctors in Australia, found that the participants "demonstrated significant deficits in prescribing of regular medications, initiation of new therapies, prescribing of discharge medications, and particularly prescribing of Schedule 8 medications" (medications with high potential for abuse and addiction) (70). A US study zeroed in on the problem with academic training and assessment: "Medical schools consider their curricula successful if their students consistently pass the United States Medical Licensing Examination... However, new physicians require more than a basic working knowledge of common disease states and diagnoses to function with even a modest degree of independence and responsibility in the evaluation and management of active clinical problems" (71). Transiently memorising vast numbers of facts offers highly limited benefit when it comes to employment. • Universities only admit a higher-achieving slice of the population, filtering out inferior workers. This heightened ability may be due to greater social capital, better pre-tertiary education or even superior genes. • Many higher paid jobs feature an institutionalised prerequisite for HE, irrespective of applicants' aptitude. • There may be an inherent bias among employers towards graduates, due to the prestige of university, or to preferentially remunerate them for their increased investment in education. There are therefore a multitude of mechanisms, which operate entirely independently of any elevated skill level among graduates, that may account for the earnings disparity between graduates and non-graduates. However, even assuming that the HE process is somehow responsible for this earnings benefit, a great many graduates are not advantaged by their qualifications. 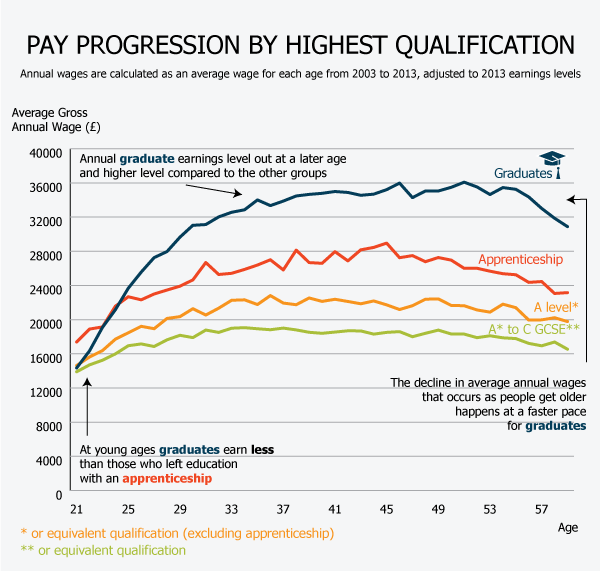 Frank Field, MP and author of the UK governmental "Review on Poverty and Life Chances" describes how "successive generations of young people have been shoehorned into universities on the promise of improving their lifetime earnings", which leaves them "saddled with eye-watering levels of debt" (73). Sir John Stuttard, master-elect of the Company of Educators elaborates: "pupils are encouraged to try for university with few other higher education alternatives presented to them. We have the prospect of many graduates leaving university with large debts and with degrees in subjects that give little or no career choice — other than to work in coffee shops and bars” (74). This is a predictable consequence of leaving such hefty investment decisions in the hands of the only people in the country of working age who have zero experience of forming a career. 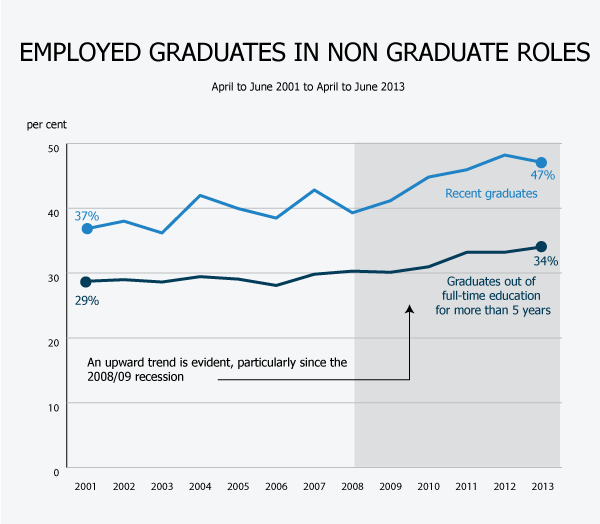 These assertions are empirically verified by the ONS, which finds that as of 2013, 47% of those who graduated in the UK in the last 5 years are working in non-graduate roles (72). 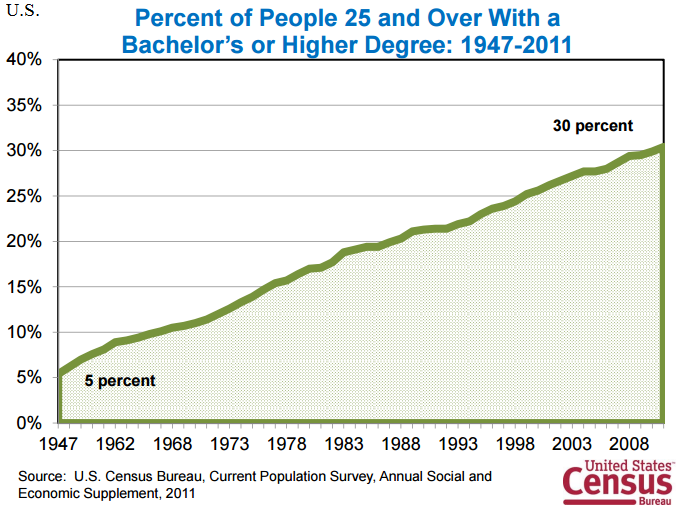 Similarly, over a third of those who graduated more than 5 years ago can be seen to still be underemployed. For both categories, underemployment is increasing and this is likely to be exacerbated by the ever-increasing number of UK graduates. Is a process that fails at least 30-45% of the time worth keeping, let alone expanding? 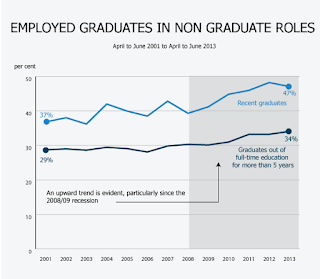 Underemployment is not the only pitfall of the HE route. Three times as many graduates (16%), as apprentices (5%), are unemployed upon their first year of entering the UK labour market (75), demonstrating the tendency of apprenticeships to conjoin the number of trainees with the availability of jobs. 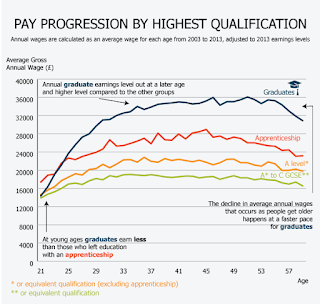 Though graduates do earn a higher wage on average than non-graduates, among British workers earning over £48,000 a year, 48% do not possess a degree (76). If earnings are a reliable gage of an individual's "skills" then it appears that half of the countries most skilled workers lack a degree. Even granting that HE engenders useful skills, this strongly suggests that it is far from the only route to their development. 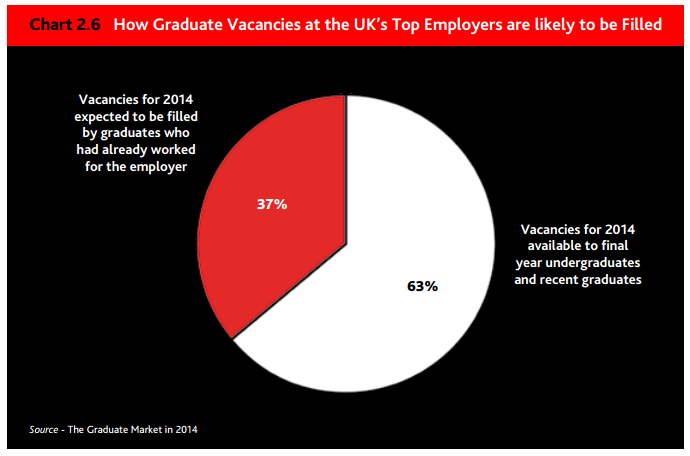 30-40% of graduate vacancies in the top-100 graduate employers are reserved for those who already have experience working for those companies, as charted below (77). This and the other selection mechanisms associated with recruitment betray the apparent inadequacy of degrees alone as a means of ensuring the quality of employees. HE is frequently cited as a facilitator of social mobility. Among the most salient metrics of social mobility is the ability to improve income and we would therefore expect to see a correlation between income equality and the percentage of the population that graduate. I.E. A higher proportion of the population graduating would lead to increased social mobility and therefore reduced income inequality. "The most widely used measure of income inequality is the Gini coefficient", alternatively known as the Gini Index (78). As income equality increases, the Gini index should decrease, with 0% equating to total equality and 100% equating to total inequality (I.E. one person having all the wealth). If, as is often proposed, HE does increase social mobility, the prevalence of HE and expenditure on it should have strong negative correlations with the Gini index. In the two charts below, this would require that the blue and dashed yellow lines slant in opposite directions. For HE prevalence (left chart), the Gini index (inequality) is actually greater in countries with more HE. Increased HE spending per student (right chart) does correspond to increased income equality but while the Gini index changes <5% across the 22 nations featured, expenditure on HE changes by approximately 300%, from <$10,000 to >$25,000. The Gini index is depicted as the line of best fit for the countries listed, which were included on the basis of availability of data (24, 79-80). All Gini data is from 2010-2013 except for Japan (2008). If HE reduced income inequality, we would expect a significant decrease in the Gini index (inequality) for the UK from 1992-2013, a period across which the percentage of the UK populating graduating more than doubled (72). 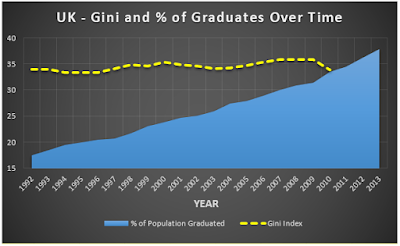 Instead, the Gini index appears largely static throughout this increase in graduates (81) and in fact, a 2009 governmental report noted that "income inequality has generally increased over the past two decades" (82). 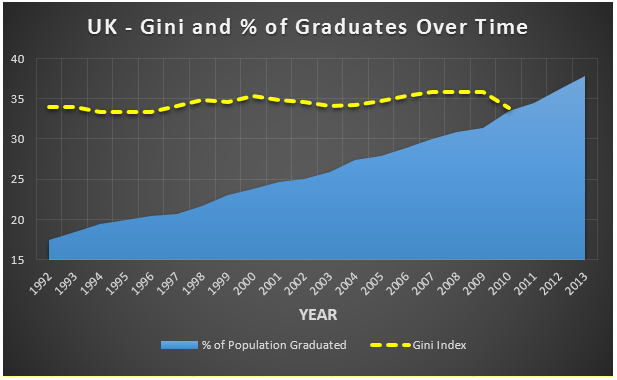 Increasing income equality, a key measure of social mobility, would require that the Gini index (yellow line), slanted downwards as the prevalence of graduates (blue area) increases. This essay focuses on the UK but US/UK pedagogies are generally the same, incorporating lectures, practicals and tutorials. US HE however features more frequent assignments, broader tuition (minors/majors) and two or four, rather than three year UK courses. Together, these two countries account for over half of the top-200 ranked universities and both are among the top-3 spenders on HE. Despite this, about 40% of new US graduates are not proficient in critical thinking (83) and, according to the UK's Department for Business Innovation & Skills, "the number of years spent in education in England does not provide a good explanation for differences in proficiency amongst the working population" (84). Private contributions to tuition fees have increased 9 fold across less than a decade in the UK, from £1,000 in 2006 to £9,000 in 2012 and "average fee levels for new students in England from 2012 are likely to be the highest for public or state-dependent private institutions in the developed world". Overall, including private institutions, the cost of HE to English students is second only to those in the US (85). This is a time of ever-increasing tertiary education, with President Obama's 2020 target for the US to posses the highest prevalence of graduates in the world (86) and the UK's goal of having 50% of the population graduate (72, 87). 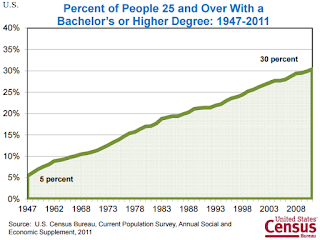 In the US 32% of the population have completed four or more years of college as of 2014. The chronology of increasing US HE is depicted for 4-year courses alone above (88). In 2015, the Equality and Human Rights Commission (EHRC) published the "most comprehensive review ever carried out on progress towards greater equality" in Britain. This review found that "a new divide has opened up: between the young and older people", with the former having "the worst economic prospects for several generations" (89). The report details how "young people are set to be better qualified than in previous generations but, despite this, experienced considerable disadvantage in the labour market" and are "more likely than older people to experience poverty". Of particular pertinence, "the strong educational performance of girls and young women did not translate into rewards in the workplace" (90). 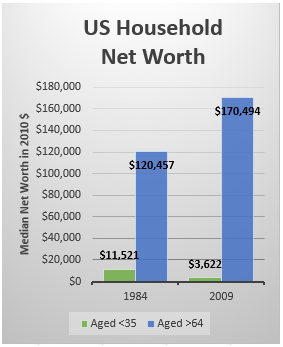 A similar trend exists in the US, where in 2009, a household headed by those aged >64 "had 47 times as much net wealth as the typical household headed by someone" <35 years old, far worse than the 10 fold disparity that existed in 1984, illustrated, right (91). Unsurprisingly, 57% of Americans believe that HE "fails to provide students with good value for money" (86). Evidently HE does not impart such economically lucrative "skills" as is often reputed and this inter-generational inequity is significantly enhanced by increasing tuition fees and university attendance. Every aspect of the service provided to HE students by universities seems substitutable to provide a far less expensive and more effective training regime. Apprenticeships/ internships alone seem apt to achieve this, though other methods could be used in unison to negate any weaknesses of apprenticeships. • These entail trainee employees shadowing experienced staff members during every activity engaged in within a given job role, while the process is explained to them. • These explanations can be inclusive of the theoretical underpinnings of processes. • Trainees can then replicate these same tasks under direct supervision and do so repeatedly, as required by the service, to thoroughly learn the process. • As apprentices become more experienced, they engage in progressively more complex tasks and are supervised less. They master one set of tasks before progressing, as part of competency-based learning. • Learning can potentially be consolidated by short pre-recorded lectures covering the more abstract aspects of any task. The same key factors that are inherently absent from HE are intrinsically integrated in to apprenticeships. Many of these are detailed in the below table, which describes a dozen areas where apprenticeships are superior to university. Children learn entire languages by being around those who use them and repeatedly doing so themselves. Similarly, adults learn skills such as cooking and driving almost exclusively through hands-on experience. Both of these involve learning multifaceted processes, while navigating a plethora of potentially lethal hazards. If two people, of equal capability, were to receive tuition, one learning at university and the other learning how to perform tasks within their chosen career, who would exhibit greater aptitude at the job? The answer is immediately obvious and while some may heckle that HE serves as more than a preparatory step for employment, this continues to be irrelevant as long as degrees are an essential prerequisite for certain jobs. A dissertation should not be needed to elucidate the normalised insanity of having the next generation of workers whisked off to buildings that are isolated from the world of employment for training. Consider how much could be achieved with the >£44,000 and the >4,500 hours expended upon university, were they redirected more productively. For example, £44,000 could pay for a senior staff member in most industries to provide full-time one-to-one tuition for a whole year and this would require far less than 4,500 hours on the part of the student. In actuality, entry-level apprentices could be trained primarily by junior staff and would not even require full-time supervision. To summarise, apprenticeships are not proposed in isolation, but in comparison to the phenomenal exertions required by the currently-dominant HE approach. Apprenticeships pair up the availability of employment with those investing in getting into a career. The current university system involves people investing huge amounts of time and money trying to qualify to enter professions where there may or may not be any vacancies. In contrast, an apprenticeship would see excess applicants rejected at the point of entry, prior to their enormous investment. It would also grant apprentices a progressively more informed opinion about whether or not they truly wished to work within that industry, allowing them to drop out prior to full investment, if desired. Instead of incurring enormous debt at the start of their careers and wasting three years of their lives, apprentices would, at worst, have the cost of living to pay. The menial tasks undertaken by apprentices would simultaneously reimburse employers for their training investment. Following on from the earlier case study of medical schools; it is bizarre that HE is considered irreplaceable despite widespread variation in graduates' ability and the absence of any metric for gauging quality. The authors of a recent UK study summarised the literature on this, noting that "preparedness for practice varies with medical school but we do not understand why" (92). This study "highlighted the importance of students learning on the job", reconfirming the findings of other researchers: "Data from trainees, and from those working with them, indicated a need for more ‘on-the-job’ training prior to starting work. Recent work by others supports our important finding [22,28,43]. Learning how wards operate, about the work of a junior doctor and how to prioritise work are all best learned on the job" (92). The rise of mass communication technology has enabled online distance-learning, such as massive open online courses (MOOCs). Despite many such courses being free and frequently lacking official "accreditation", a multitude of studies indicate that they are at least as effective at teaching as traditional courses (93-96). Furthermore, a nationally representative US study found that "students who take some of their early courses online or at a distance have a significantly better chance of attaining a community college credential than do their classroom only counterparts" (97). Some critics of distance learning suggest that people cannot be relied upon to work from home. This however is contradicted both by the above studies and by others which find that working from home boosts productivity and increases worker satisfaction and retention (98-99). Many people work from home and this trend is increasing, despite those employees needing to support themselves and their businesses in competitive markets, unlike universities; with their captive clientele. Online courses are whole orders of magnitude cheaper than traditional tertiary education, due to the elimination of needless duplication, as well as the costs of maintaining a campus. This not only negates the need for students to become heavily indebted but additionally enables almost universal education, delivered by the most accomplished teachers. Shai Reshef gave a TED talk, detailing some of the many benefits of his online courses for people around the world. Efficiently run apprenticeships contemporaneously pay for themselves, with completion rates of minimal concern as trainees perform a combination of menial tasks, in addition to receiving valuable training, consolidating their knowledge of the basics, while contributing to the company's output. A trainee who drops out early has already "paid for their stay" and gained valuable work experience and an enhanced awareness of what job roles they are well suited to in the process. Individuals would be naturally disincentivised from remaining perpetual apprentices by the low wages of these entry-level jobs. Both completion and uptake rates would likely be greatly elevated if apprenticeships ceased to be "perceived as being of lower-status compared to traditional post-secondary educational pathways" (100). Furthermore, the fact that "tighter regulatory frameworks are required to protect young people in apprenticeships from exploitative practices" could offer potential for professional bodies to finally serve a useful role, that genuinely benefits their subordinates (101). Mechanisms for assuring the training of employees are already in place. Employees who fail to engage with training, as measured by competencies, are fired or don't advance. Employers who fail to deliver their product or service to the required standard go bankrupt or suffer expensive litigation. Only organisations such as universities can escape this, as they rely on a captive clientele thanks to the institutionalised mandate for qualifications in order to ascend many career paths. The customers of other businesses are not penalised in any way for refraining from purchasing a service/product, other than by its absence. In contrast, failure to purchase a degree can have life-long, and frequently totalitarian, consequences for earnings/employability, irrespective of any demonstrable skills. If a narrow scope is all that is required to do a job then that should be sufficient. Education superfluous to a job role can be pursued by individual employees as a hobby, at their own expense and leisure. If employers deem such information useful then it could be incorporated into any apprenticeship, as described above, thereby maintaining that information within the workplace, rather than having it learned at university and then progressively forgotten as time passes. Concerns about the restricted inter-firm transferability of apprentices are unfounded both in that HE is presupposed to avoid this pitfall and in that it is without empirical substantiation. A longitudinal Swiss study of apprentices found "high inter-firm and low occupational mobility", concluding that "skills are highly transferable within an occupational field" (102). Some may suggest that exposure to HE empowers students to bring the latest innovations to the workplace. The preparation of students for employment only requires that they know the existing state of the art however, rather than the fruits of ongoing research. Students do not enter employment and immediately begin revolutionising the workplace. On the contrary, students typically occupy entry-level jobs where their influence over operations is minimal and they gradually learn from the current experts and develop competency through on-the-job training. They additionally benefit from multiple trainers per trainee, in contrast to HE, where UK students spend over a third of their time in classes containing >50 pupils (01). This sentiment appears almost laughable when considered alongside the previous sections detailing the indifference of HE providers to evidence-based pedagogies. Whereas advanced tuition may have historically been more necessary to compensate for the inefficient modes of information storage/retrieval, in the digital era, search engines, and information technology more generally, serve to greatly expedite our ability to source relevant information. The benefits of interacting with fellow HE students are often much lauded, though students are far from the most intellectually stimulating or enlightened within society. Sir Andre Geim, a Manchester University physics professor and Nobel laureate exemplified this when he stated: "I don’t like students very much... they come absolutely ignorant and they are not grown up yet as interesting people" (103). Furthermore, while university may feature interactions with students and lecturers, apprenticeships feature interactions with those constituting an entire spectrum of an industry, as well as those in parallel industries and fellow apprentices. It is a false comparison to imply that the sole alternative to interacting with students at university is to interact with nobody. That students collectively achieve a wide spectrum of grades at any single university, despite going through an identical pedagogical process, reveals that achievement is primarily a product of students' pre-existing abilities, rather than any significant contribution of HE itself. This is especially true now, with increasingly robust electronic attendance monitoring ensuring that students endure all scheduled sessions. In fact, "the single most important (and reliable) predictor of university student achievement in recent decades is self-efficacy" (104-105). This should be unsurprising, given that students spend well over half of their time in HE engaged in independent study (01). As is apparent to any who untangle themselves from the myth that university attendees are granted irreplicable mystical powers of self-enlightenment, if the most important factor in success is independent of HE then clearly there is no reason that learning cannot occur within the working environment, where it would have enhanced relevance. The commodification of HE undermines its claimed role as an installer of valuable skills for employment. Across the same period that the prevalence of HE has rapidly increased, "commercial values are found to be usurping the previously dominant knowledge focussed values in universities" (106). Meanwhile, adolescents continue to be brainwashed in to believing that the HE process is genuinely beneficial, as is evident from employers' and new graduates' disparate assessments of the latter's preparedness for employment. Even were prospective students alerted to this fact, universities are insulated from the market forces suffered by other businesses, with failure to purchase their service severely punished, as seen in the differential between graduate and non-graduate pay. Of pivotal importance, acquiescence should not be misconstrued as endorsement of HE; participation levels are not representative of the quality of service, as they might be in other industries. The insurmountable superiority of on-the-job learning to academia is exemplified by the open secret that employers value experience almost to the total negation of any concern for the bit of paper a university gave that entitles applicants to apply for jobs. Though constantly limited by the presupposition that learning may only occur within a classroom, researchers often acknowledge that "the lack of coherence in curriculum, pedagogy, and learning theory requires reform" (53). The excessiveness, abstractness and limited-applicability of information covered at universities severely undermines the alleged broadness and endurance of a university education. The knowledge is transitory, sustained just long enough to pass exams, after which it is irrelevant and so swiftly forgotten. The average human mind is simply not predisposed to retain so much when it is not regularly retrieved. The contingency of future employment and therefore quality of life upon performance at university make learning a strenuous competition, rather than an enjoyable edification. Lecturing on many facts is redundant if those facts do not persist in the minds of those present or if they can easily be ascertained when needed. In short, if, as the above essay suggests, HE is not an efficient use of resources, then forced participation is wasteful, irrational and unethical. HE should be an optional frivolous pursuit for some, rather than a mandatory prerequisite for all who wish to escape relative poverty. It must not be forgotten that the burden of proof lies with those who claim HE to be effective and impose restrictions upon others who decline to engage in it.